Businesses offering free Internet access will inevitably find hotspot freeloaders, hanging out and using the WiFi for long periods. Freeloaders will make your business their virtual office, taking advantage of your service, which is supposed to be a convenience for you, your business and your customers. You can give customers the password to your WiFi with a purchase, which is an option that will limit freeloaders, because most customers will respect your wishes and not give freeloaders the password since they chose to patronize your establishment and the freeloader did not. One way to limit freeloaders is to issue tickets with each customer’s receipt, generating a unique user name and password for the customer to use. Certain ticket printers will allow you to set time limits and discouraging freeloading. Customers who genuinely want to use your WiFi while they enjoy their meal or beverage will have no problem with this type of solution as long as you allot them a reasonable amount of time. If you do not want to bother with issuing tickets, use your splash page to request that only customers use your WiFi and that they need to limit their usage to a reasonable amount of time. However, freeloaders will most likely not abide by your requested terms. Why Should I Worry About Freeloaders? Freeloaders may download illegal copies of movies or music and representatives of the copyright holder would then contact the ISP address from which the download occurred. A business could lose their Internet service if their provider was continuously contacted about copyright infringements. There is also a chance a freeloader could choose to conduct illegal online activities from public WiFi in order to remain anonymous. 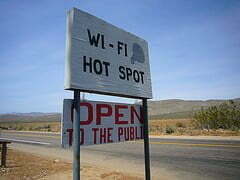 Remember to turn off access to your free WiFi when you close if people can access your Internet from outside. You don’t want freeloaders hanging out in your parking lot or on benches outside your establishment after hours. Always monitor your hotspot’s usage, this will help you find nearby apartments or offices that are freeloading off your WiFi. If you have zero customers in your coffee shop and a user watching a two-hour movie, shut down your WiFi. Stop your connection when you see freeloaders each time you can without interrupting your own business or your customers and the freeloaders will tire of losing their connection and move on. You may also be able to block specific users if you are using a hotspot gateway. Being a local WiFi hotspot will bring in more customers if you advertise free WiFi, so do not let freeloaders ruin your latest promotion. Get your business listed in directories of free WiFi spots and take advantage of the free advertising. You’ll see more business when you offer free WiFi, just limit your freeloaders. You can always put up a sign that directs non-payers to the public library, if they offer free WiFi. This obvious hint should let the freeloaders know you’re on to their tricks. Peter Wendt is a writer from Austin, Texas. His house has a terrible wi-fi signal, so he ventures out to nearby coffee shops on a regular basis, which uses this reliable wifi hotspot provider, so that he is able to complete his research.